An assortment of at home recipes with a special emphasis on the age old art of grilling & smoking. A beautiful, dry sunny fall day in Dallas....its been a while since we have really seen the sun. Think its time to smoke something. Nothing could be better. It is real easy to do and gives you the opportunity to have turkey year round. Bought a 6.5lb turkey breast. Rinsed it in cold water and patted it dry. Rubbed it in with EVOO (extra virgin olive oil) and liberally coated it with a good dry rub. Place a small cooling rack in the bottom of a baking pan and add about 1-1/2 cups of chicken broth in the bottom....just enough to cover the bottom. Make sure the pan is one that you don't mind using in a smoker since it is going to turn dark due to the smoke. I then cut up 2 apples and 2 oranges and arranged the pieces on the rack. Place the turkey on top of the fruit pieces. Then place the whole thing in your smoker. 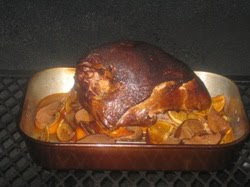 I used a combination of both Hickory and Pecan and started it at a temperature of about 325 F. After about an hour I lowered the temp to about 200 F. Smoke it for about 4 hours or until the internal temp is about 175 F.
The fruit serves a duel purpose. Not only does it provide much needed moisture to the meat during the smoking process and help keep it from drying out, but it also adds a little extra flavoring to the turkey. Also, be sure to allow your meat to sit lightly covered for at least 15 minutes prior to cutting. This will allow the juices to spread evenly back throughout the meat. Click on this link to be taken to my new website. "Any time is a smokin good time for grillin "